Recently, someone told me that people are interested in the story behind cottage industry and want to know the people behind the product. I have never been a "blogger," and I don’t like writing about myself. So here I sit, trying to dig up the words that can express the indescribable work that God has done in my life through designing and producing stoles. At the age of 38, everything seemed to be falling apart for me. My health had reached a crisis point and I was beginning to see that I was not the person I had tried to believe that I was. I struggled with pain, fatigue, rage, and self-destructive thoughts. I had a job that was clearly not working out, and I was beginning to see that the problem was mostly me. No job had ever worked out, and a definite pattern was unfolding. I was confused and terrified. Memories of that time are full of shadow and dark emotion. That year I was diagnosed with fibromyalgia, after 27 years of suffering, first being told it was “growing pains,” then “you’re too young to be in that much pain,” and finally, “at your age you should expect some aches and pains.” At the point of diagnosis, I was in bed most of the day, simply from the fatigue I was experiencing. I was still managing my part-time job. I don’t remember how I got dinner on the table or other things that my family needed. My memories are hazy. My doctor had told me that if I wanted to get better I would. Reading between the lines, I knew that this doctor did not understand the disease or what to do for it, and, as a result, had relegated it to the category of psycho-somatic. I turned to alternative medicine at that point and gradually regained health and the ability to function almost normally. Having made significant progress with the fibromyalgia, I was able to turn my attention to my emotional issues. I knew at the time that it had something to do with childhood abuse. I knew that my symptoms, and inability to stay employed, indicated fear of certain types of authority figures. I became convinced that I needed to find a way to be adequately self-employed so that I could avoid repeating the cycle of unhappy employment situations. I was almost 40, and I had never really found my niche. I felt the Holy Spirit repeating, “use what you have.” I began taking inventory of my skills and desires. I loved to sew and had used that skill in the past when I needed extra income. I was also very involved in our church and became interested in the textiles involved in worship - the vestments. 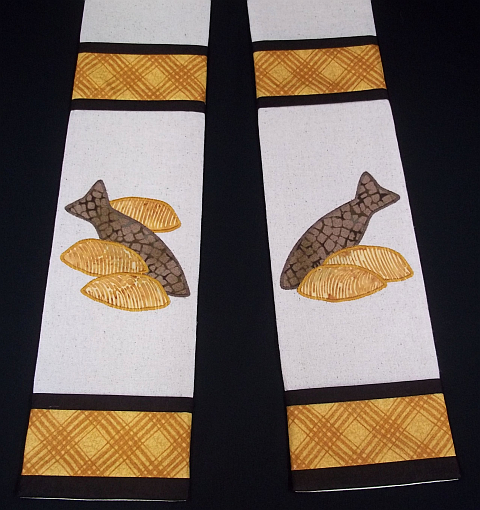 Finally, in April of 2008 I had designed and made two stoles and offered them for sale on eBay. A few months later, shortly after my 40th birthday, the first stole sold. As I grew in confidence in what God was doing through me, I began to see it as a ministry. It is a ministry as much or more to my own soul as it has been to the clergy who purchase or receive the stoles. I have grown in my faith, and my trust in God has expanded as I have seen him manage the business side. I have learned that my part is to be faithful to design what flows from His love inside me, and to simply get up each day and meet the work that He has for me. Over time, I was able to ease out of the part time job I had into full time self-employment. Early in 2013, I received an official diagnosis for my emotional problems: Post-Traumatic Stress Disorder as a result of chronic physical and emotional abuse throughout the first 18 years of my life. It has been helpful to understand this disorder and how it affects my physical health and my relationships. By focusing on Christ and his love, and trusting in His healing, I have been able to allow God to work on this area of my life and my family has seen a lot of progress in my ability to manage my emotions. The design of the loaves and fish, pictured above, is perhaps the best icon of my ministry. I had so little to offer. In fact I had less than nothing. I had two disabling conditions, which I had to learn to completely surrender to God. Since 2008 I have seen God take what I have to offer -- two negatives -- and turn it into a feast for my soul, and a ministry of worship to His glory. I salute your courage and praise God for your fortitude in following your calling. Blessings.